Recently, I have been learning more about Asa Aldrich of Cumberland, Rhode Island and nearby Sheldonville (West Wrentham), Massachusetts. 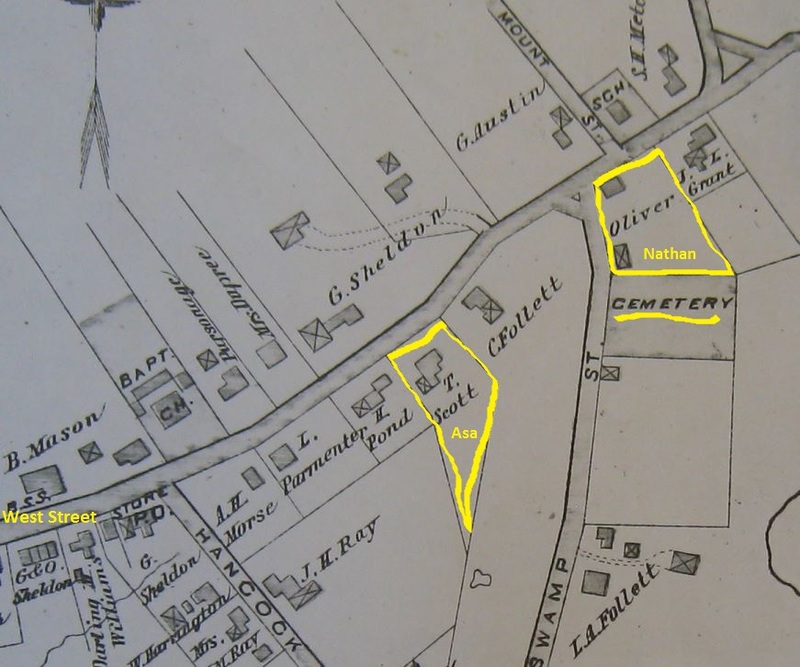 This recent curiosity began over the past year as I have corresponded a bit with a small group of volunteers who are documenting some cemeteries that my Aldrich and Darling ancestors are buried in, particularly the Sheldonville Cemetery. The cemetery is in back of a house that has a historic marker for my 5x great grandfather, Nathan Aldrich, in the Sheldonville village in Wrentham. When I mentioned Nathan Aldrich’s house in an email, one of the volunteers told me something very interesting. She gave me the address of another house very near to Nathan’s on West Street that had belonged to Asa Aldrich, Nathan’s father. He is my 6x great grandfather. 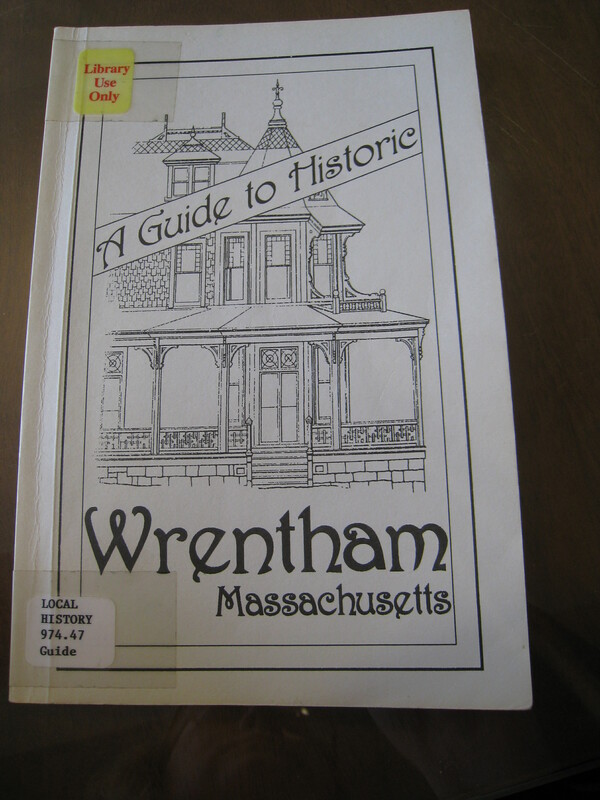 She kindly copied the entries for both houses that she found in a booklet by the Wrentham Historical Commission, A Guide to Historic Wrentham, Massachusetts, 1993. She was sure that the public library had a copy. This is the story of how that small collaboration led to a lot of new information for me. 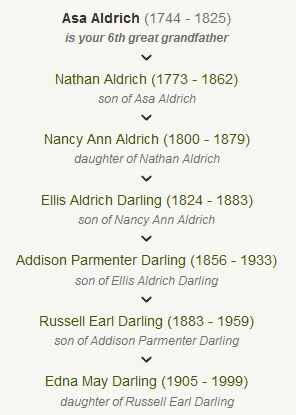 My grandmother Edna Darling is a descendant of Asa Aldrich. Asa Aldrich was born 10 May 1744 in Mendon, Massachusetts (1). He was the first child born to Jonathan Aldrich and Patience (Gaskill) Aldrich (2). On his father’s side, he descended from George Aldrich and Fernando Thayer (among the original settlers of Mendon, Massachusetts), and on his mother’s, from early Salem and Ipswich families. Provided Southwick, Salem’s Quaker daughter who was immortalized in the Whittier poem “Cassandra Southwick” was Asa’s great-great grandmother. Asa and Lucy had two sons recorded in Wrentham, Nathaniel in 1771 and Nathan in 1773 (3). The other children were recorded in Asa’a probate record, 1826, and in various deeds: Abigail (Aldrich) Barnes, David Aldrich, Amey (Aldrich) Hancock, Amos Aldrich, and Samuel Aldrich. A Suffolk County deed from 1772. It occurred to me that since Norfolk County deeds, online at FamilySearch, begin in 1793, there must be earlier deeds in a parent county. That would be Suffolk. There were some deeds from prior generations there, and a 1772 deed for Asa, who purchased 74 acres from Thomas Jenks of Cumberland, R.I. The southern bound of the land “borders Hathaway’s” which, based on my previous mappings for Richard Ballou’s property, puts the southern end in Cumberland, R.I. It’s bound to the West by “Indian Meadow Road” which I believe may be today’s Burnt Swamp Road. I believe this property was the basis for various gifts of land Asa later gave most of his sons. 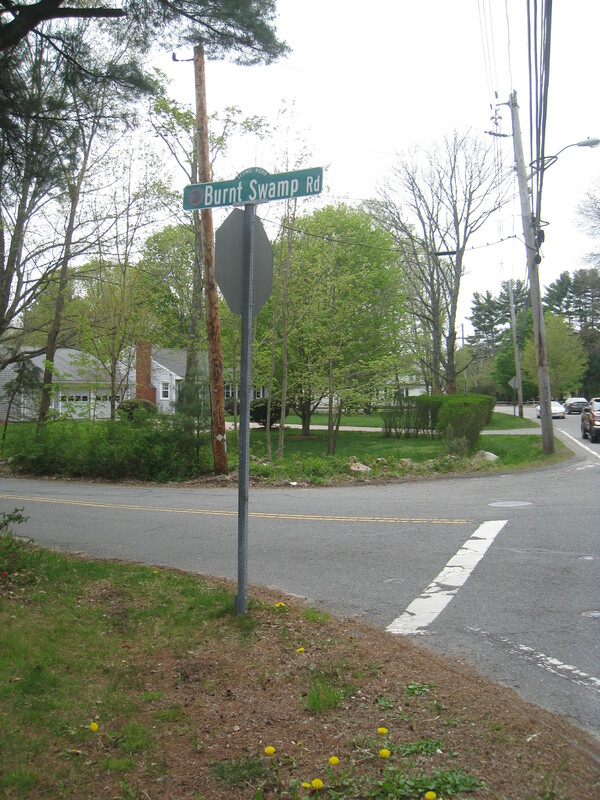 The intersection of Burnt Swamp Road (which begins in Cumberland, R.I.) and West Street in Sheldonville. This picture was taken in front of the house with the Nathan Aldrich, 1841 plaque. 1782 Rhode Island census lists Asa in Cumberland with a household of six, apparently in neighborhood order, amidst relatives that I am familiar with. 1788, Asa was serving as an overseer of the poor in Cumberland, Rhode Island. I first learned about this in Unwelcome Americans: Living on the Margin in Early New England by Ruth Wallis Herndon (5). On the library trip, described below, I found several notes from the town records about Asa’s activities looking after the poor. This one made me laugh. 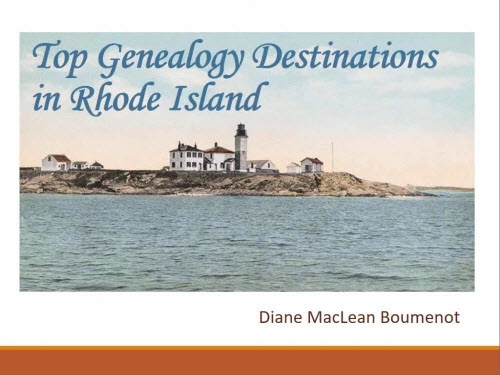 Asa only appears once in the Records of the Colony of Rhode Island. [October, 1790]. Whereas, it appears to this Assembly, that Asa Aldrich, an inhabitant of the town of Cumberland, in this state, hath been deemed by the select men of Wrentham, in the commonwealth of Massachusetts, an inhabitant of that town, and in consequence thereof hath been greatly vexed and oppressed. It is therefore voted and resolved, that His Excellency the Governor, be requested to write to his Excellency the Governor of Massachusetts, representing the state of this matter, and desiring that the select men and inhabitants of the said town of Wrentham, may be directed to surcease all proceedings against the said Asa Aldrich, until the line between said commonwealth and this state, in that part, be settled. (Volume 10, page 397). 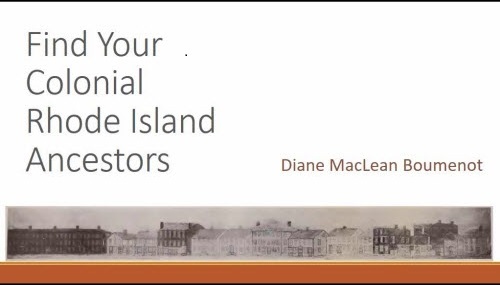 I got a chuckle after years of confusion about whether Asa and his sons really lived in Cumberland or Wrentham, to find that the states of Rhode Island and Massachusetts were likewise befuddled over 230 years ago. I’m not feeling so stupid now. In a situation like this, you always ask yourself whether the person stayed in one spot, but the county/state lines changed. I now think Asa may have moved, living first on the Rhode Island end of his property, but later in life, on the Massachusetts side. 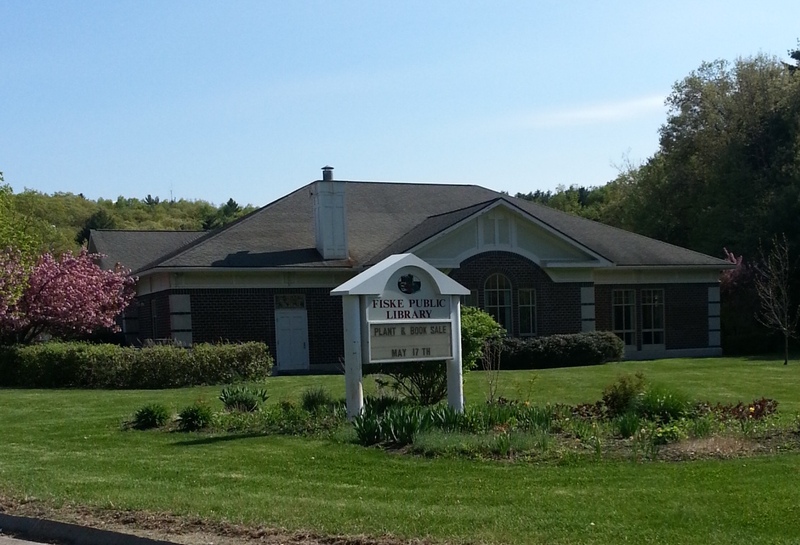 Sheldonville Baptist Church: I had seen in Mrs. Sprague’s manuscript about Cumberland (4) in the Rhode Island Historical Society Library that the Aldriches were Baptists. Several of my direct line were married by Justices of the Peace, but I know that in 1873 Asa’a great granddaughter Abby Darling married Julius Mead at the Sheldonville Baptist Church. When I visited Sheldonville, there was the church itself, within view of the houses my ancestors lived in. How involved were they? I need to explore this further. 1790 census. After the additional research I’ve done in maps, graves, and other records, when I look at the 1790 census it immediately jumps out at me that Asa is next to his father in law, Abner Haskell, and his wife’s twin brother, Comfort Haskell. Since there are still some Haskells located on the 1838 Cumberland map given to me by John Tew (see his blog post here for how to get the map), that further clarifies the location of Asa’s house as being on the western edge of Sumner Brown Road. Sheldonville, 1888 map showing the location of the cemetery on Burnt Swamp Road, Nathan’s former house, and Asa’a former house. Asa’s house in Sheldonville. Thanks to my contacts at Find A Grave, I was alerted to Asa’s house in Sheldonville, and drove up to see it, see below. Asa and Lucy’s graves. I also found, thanks to the entries of those same volunteers of the West Wrentham Cemetery, Asa and Lucy’s graves, see below. Asa’s 1826 probate situation is complicated since it seems to have been processed both in Wrentham, Mass and Cumberland, R.I. , and involved a dispute that I cannot really understand. I am still gathering the complete documents. 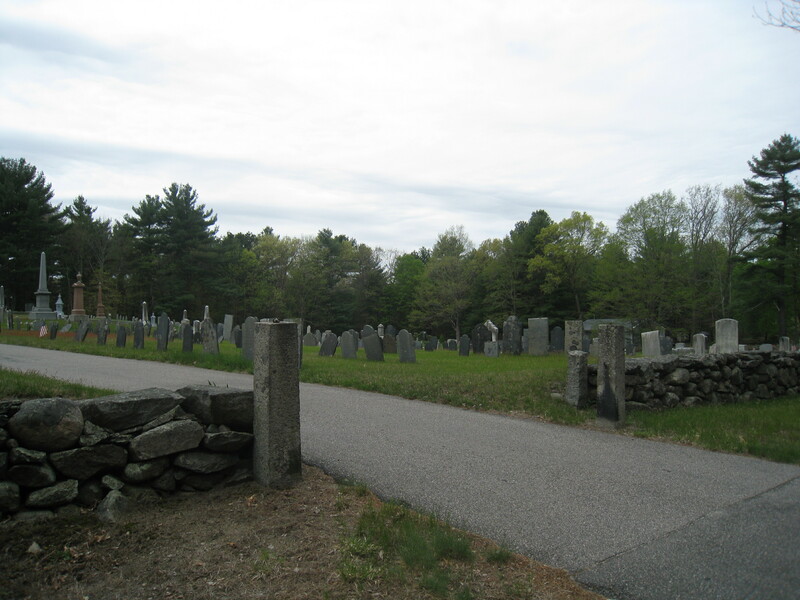 I visited the West Wrentham Cemetery recently to look for the graves of Asa and Lucy (Haskell) Aldrich. 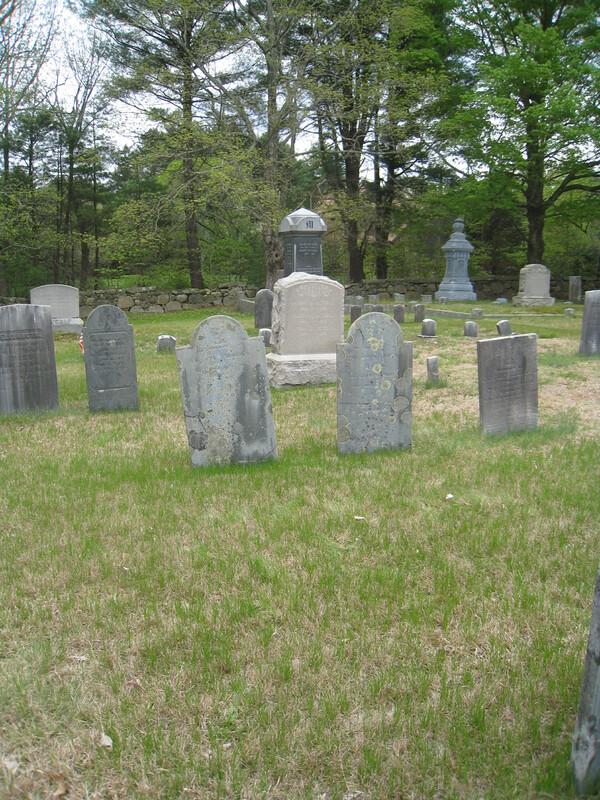 There were pictures on Find A Grave, of rounded gray markers with the small shoulders rather common for the early 1800’s. I thought I could find them easily, but as I looked around I realized most of the graves looked exactly like that. I finally found them, over to one side. Asa and Lucy have matching stones, surrounded by names I’m not familiar with. But in other parts of the cemetery, I spotted many members of Lucy’s family. Over the course of this particular search I grew much more familiar with all the siblings and spouses. 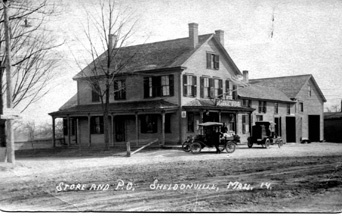 Looking at early maps, cemeteries, and town notes now, I am starting to recognize most of Sheldonville’s early population. Graves of Asa and Lucy (Haskell) Aldrich. As I prepared from home to visit the Fiske Public Library to see the Guide to Historic Wrentham I didn’t note anything special on the website. The day of my visit, I found the library down a side street, parked and entered, and inquired about the booklet. I was quite surprised when the librarian asked if I was looking for the Genealogy Room. Well, sure I was. That sounded good. The Genealogy Room was an attractive, quiet space lined with books. There was a microfilm reader and a small collection of useful microfilm. I photographed the boxes of microfilm so I would have the titles. 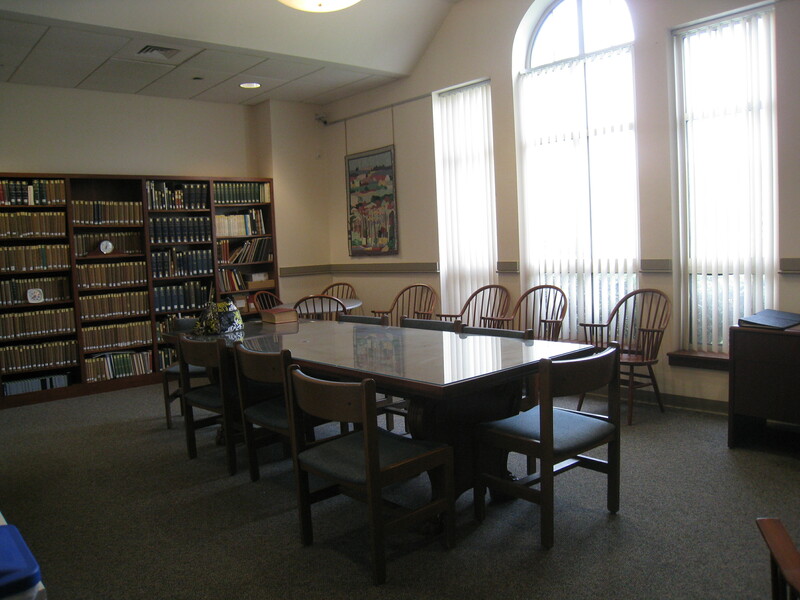 The Genealogy Room at the library, donated by the Ross Family. One very notable feature of the collection was the Wrentham Historical Society MacDougald Collection, a large set of binders covering one wall, containing a huge variety of information about historic Wrentham. 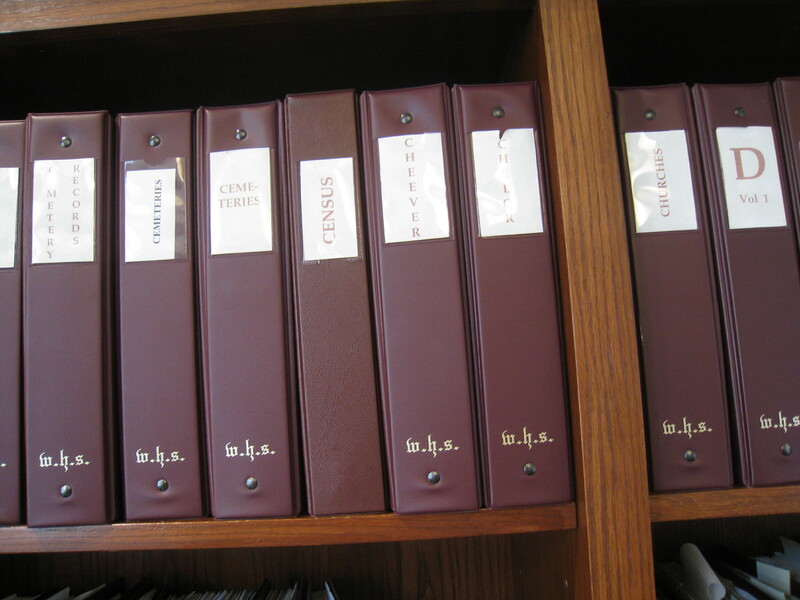 I looked through 10 or 20 of the binders; they are well indexed and hold notes, lists, clippings, abstracts, letters, and copies of all sorts of documentation such as cemetery records, maps, family history, and town business. I photographed so many pages, particularly of the cemetery plot information and the abstracts of town business (sorted by name), that I went through the two camera batteries I had and started on my phone camera. One interesting item that I found in the “Aldrich” pages was a study of Asa and Lucy’s son Amos Aldrich, one of the first boat builders in Sheldonville, an area known for boat building. Another thing I learned, in my reading of the Guide to Historic Wrentham, was that Asa’s son Nathan Aldrich, my 5x-great grandfather, was “a local farmer and builder, who built many houses in Sheldonville”. Two that still exist today are 57 Hancock Street, c1840, and 63 Burnt Swamp Road. I had usually seen him described as a farmer, but like many New England farmers he clearly pursued other work as well. At last, a detail about my ancestors that my husband, the woodworker, might appreciate. [Simple Georgian – 1816]: This house with gable end to the street and entrance on the side has retained its old corner trim, cornice, cornice returns, doorframe and fine proportions. There is a shed dormer on the rear and the usual center chimney. The first owner was Asa Aldrich; the second was his son, Nathan. Subsequent owners were boat builders, Charles Follett in 1859 and Charles J. Farmer by the turn of the century. Asa Aldrich’s house in Sheldonville, from rather late in his life, 1816. 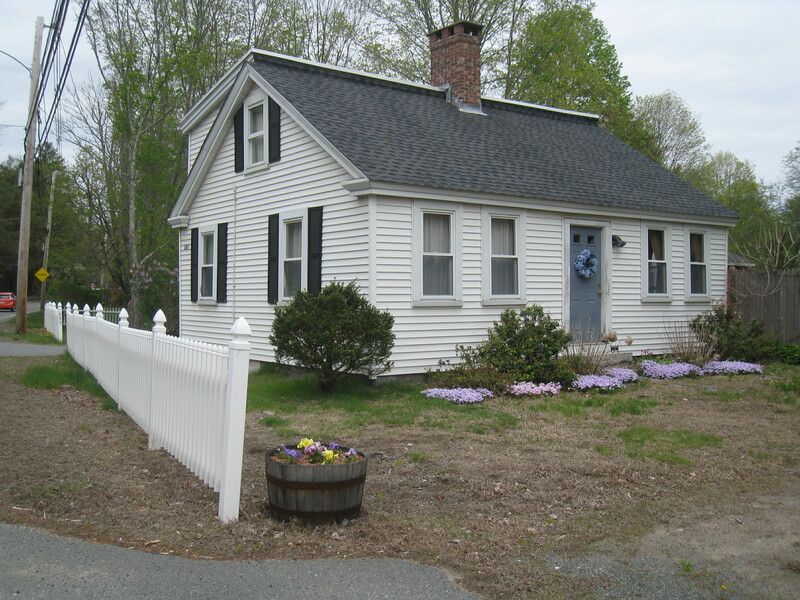 If Asa was the original owner, I have to wonder if Nathan built this house, in fact it resembles other houses pictured in the Historic Wrentham booklet. It meant a lot to me to find another house of my ancestors, particularly one almost 200 years old. If, according to the booklet, Nathan Aldrich lived in this house later in life (from the deeds I can see that he sold the house with the plaque to his son William in the 1840’s, and William ultimately sold it and moved away) then this one could be the house where Nathan was enumerated in 1850 and 1860, with his grandson Ellis Aldrich Darling, my 3x-great grandfather, and his family, and where my great-great grandfather Addison Parmenter Darling was born in 1856. Addison left Sheldonville in 1872, as a teenager, to learn silver engraving with his new brother-in-law in the city of Providence. Many years later, my great grandmother asked my folks to take a drive with her up to Sheldonville, to see if she could spot the house where her father-in-law had been born, but she couldn’t pick it out. Now, perhaps we’ve found it. (1) Town and City Clerks of Massachusetts, Massachusetts Vital and Town Records, 1620-1988 , database, Ancestry.com (www.ancestry.com, accessed 19 May 2014), entry for Asa Aldrich (Mendon, Births, p. 80). (2) Aldrich, Ralph Ernest. 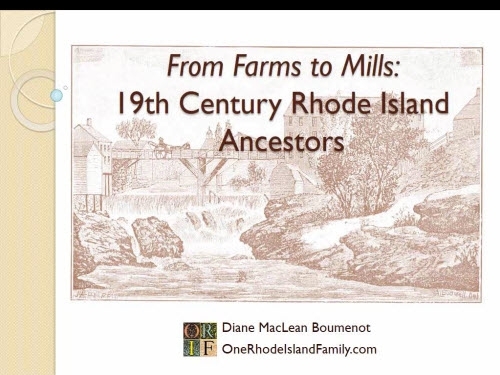 The Aldrich Family Genealogy : Descendants of George Aldrich of Mendon, Mass. Part E: Jacob. National Aldrich Association, 1998. (3) Vital Records of Wrentham, Massachusetts, to the Year 1850. Boston: 1910. Volume 1, Births. Entry for Nathan and Nathaniel Aldrich, page 11. (4) Sprague, Mrs. Abigail. Unpublished notes, History of Cumberland. c 1890-1906. Rhode Island Historical Society MSS 1023. Box 1, folder 43: Hathaway Mills neighborhood. Box 2, folder 32: Aldrich family. Box 2, folder 40: Ballou. (5) Herndon, Ruth Wallis. Unwelcome Americans (Philadelphia: University of Pennsylvania Press, 2001). Color photos by Diane Boumenot, 2014.